An important characteristic of a sound wave is the phase. Phase specifies the location of a point within a wave cycle of a repetitive waveform. For most purposes, the phase differences between sound waves are important, rather than the actual phases of the signals. When two sound waves combine, for example, the difference between the phases of the two waves is important in determining the resulting waveform. The phase difference between two sound waves of the same frequency moving past a fixed location is given by the time difference between the same positions within the wave cycles of the two sounds (the peaks or positive-going zero crossings, for example), expressed as a fraction of one wave cycle. Two sound waves of the same frequency that are perfectly aligned have a phase difference of 0 and are said to be “in phase.” Two waves that are in phase add to produce a sound wave with an amplitude equal to the sum of the amplitudes of the two waves. Two sound waves that are in phase add to produce a sound wave of greater amplitude. Credit DOSITS. If one of the two sound waves of the same frequency is shifted by one-half cycle relative to the other, the sound waves are said to be “out of phase.” Two waves that are out of phase exactly cancel each other when added together. This principal is used in noise-cancelling headphones. 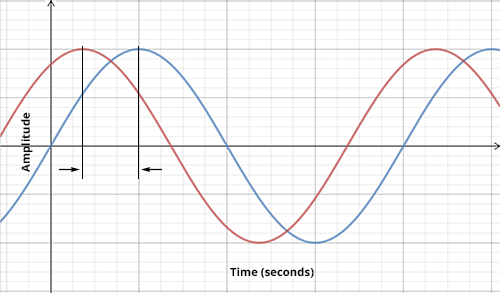 Two sounds waves whose phases differ by one-half cycle exactly cancel when added together. Credit DOSITS. A short DOSITS video about phase. 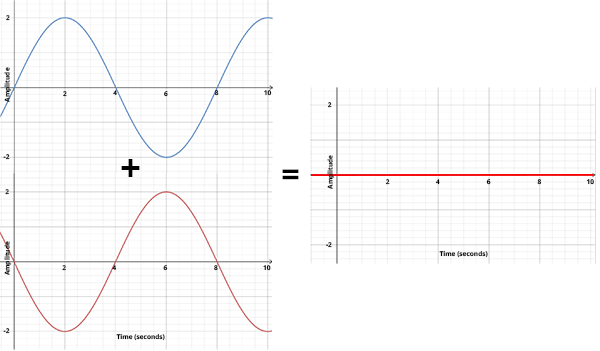 where y(t) is the waveform, A is the amplitude, f is the frequency (hertz or cycles/second), and t is time (seconds). In this equation the argument of the sine function (2 π f t) is an angle expressed in radians, with π=3.14159… The sine wave is periodic, consisting of wave cycles that repeat, as shown in the following figure. The locations on a wave cycle can therefore be specified as an angle in either radians or degrees, as well as in fractions of a cycle. This can be visualized with a rotating wheel and a spoke tracing the sine wave. DOSITS animation illustrating phase angle and a sin wave. Most sounds are much more complex than a single frequency, but instead consist of many different sine waves at different frequencies. When more than one sine wave combines to create a sound, the waveforms of all the sine waves are added together at each location along the waveform. Humpback whale songs can be typically heard in their winter breeding grounds (e.g., Hawaii), but this recording of a humpback whale singing was actually taken in one of their feeding grounds on Cordell Bank Canyon, off the coast of San Francisco, CA. The echoes you hear are from their sounds bouncing off the canyon walls. Sound ©Thomas R. Kieckhefer. Released under Creative Commons License, non-commercial attribution. Hydrophone arrays use the differences in the phases of signals received at two or more receivers at different positions to determine the location of the source of the signals. This is called beamforming. Projector arrays use the difference in the phases of signals transmitted by two or more projectors to control the direction in which the sound is most intense. Vector sensors use a similar principle. Indiana University, Introduction to Computer Music, What is Phase?